Prominent & Leading Manufacturer from Ghaziabad, we offer electric winches. 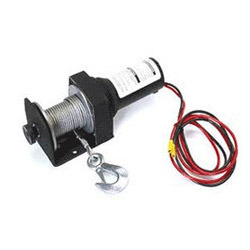 Our firm manufactures and supplies a wide range of best quality products and in this range we are availing Electric Winches. This product is basically a device that consists of a horizontal cylinder that is turned back by a crank over which a cable is binded. Customers are in wide demand of this range due to its major features. We avail this range at the most comprehensive and industry leading prices.